Hair Farm: Fast, Powerful, and Easy to Use Hair Farm is a complete hair solution for 3ds Max. It is specifically designed for CG professionals who wish to create gorgeous hair quickly and precisely. 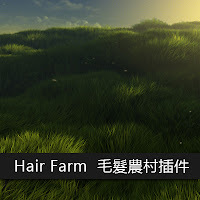 Hair Farm comes with over 50 different tools for hair modeling, animation, and rendering.